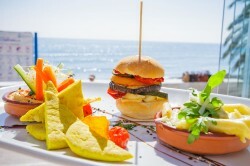 A fantastic and modern place for casual beachside dining in Marbella serving all kind of meals of international cuisine. 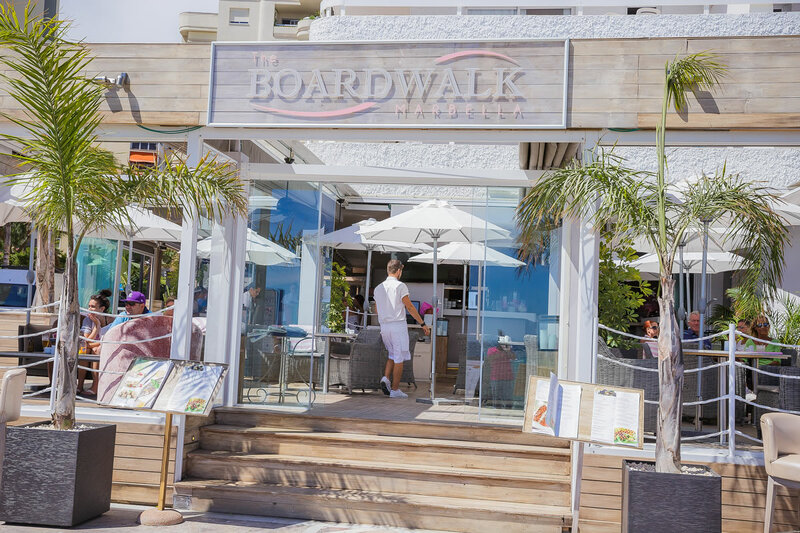 The Boardwalk is a restaurant and bar located in the promenade of Marbella where you can enjoy a nice meal during any time of the day with splendid views of the seafront and a fantastic atmosphere. It is open from 9 am in the morning until midnight. They offer casual dining with an extensive choice of dishes a la carte since the type of food served varies from burgers, pastries, fresh pizzas, seafood, wraps and sandwiches. It is also a sophisticated lounge where you can have drinks choosing from the wine list or international beers, and also it is a perfect place for the traditional English afternoon tea or just for desserts as they have freshly baked cakes daily. The restaurant has a very chic and elegant atmosphere and look, you can either stay indoors in their comfortable chairs and couches or in the terrace to enjoy the good weather during summer and spring. It’s suitable for families and friends get together or celebrations such as birthdays, hen parties or baby showers. They offer special prices for big groups and events as well as a decoration service to make your party or event memorable. The Boardwalk Marbella usually have ambient and relaxed music playing in the background which along with the elegant white decoration of the place makes it a unique way of relaxing by the beach. The restaurant offers a different experience from all the other places nearby and suitable for all kind of people since you can choose from having a typical English breakfast, brunch, afternoon tea, lunch or dinners. Another extra bonus is that The Boardwalk supports a local charity called Positively Pink for cancer awareness and they donate 1% of their earnings to this charity. They also host special events throughout the year to raise more funds.